Network Traffic Analysis in the Distinct Network Monitor expands on the concepts of packet sniffing and decoding, by interpreting network protocol negotiation into plain English. The product offers a high degree of flexibility and provides you with the ability to selectively narrow down problem areas fast while executing network traffic analysis. For example a typical Telnet negotiation shown as: ff fd 18 ff fd lf ff fd 23 ff fd 27 ff fd 24 in some competing products, is parsed into a more human-readable form: TELNET Do Terminal Type Do Window Size Do X Display Location Do New Environment Option Do Environment Option (see the left screenshot). 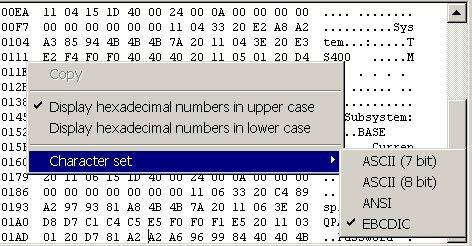 To expedite network traffic analysis, packet contents may be interpreted using ASCII character set, or in EBCDIC, which is useful when dealing with TN 3270/5250 packets.